Sea urchins are relatives of starfishes and belong to a group of animals called echinoderms. They are mostly encountered on rocky shores, beaches and coral reefs. 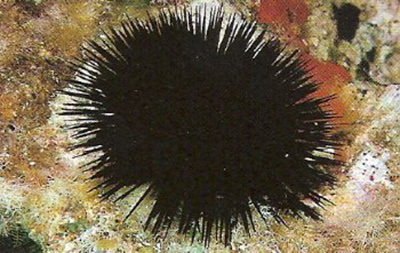 Sea urchins are characterised by moveable spines that occur in a variety of shapes and colours. There are about 800 described sea urchin species worldwide, over 200 of which are recorded from Australia. Sea urchins generally feed by grazing on plant material growing on surfaces, or by burrowing in sediments to find decaying material. They can reach high population densities and, through their feeding activities, can be key organisms in determining the community composition and appearance of marine ecosystems. 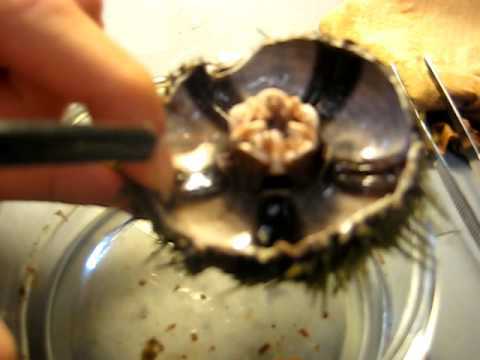 Most of you should know what a sea urchin looks like! Although its common name is the Black Sea Urchin, sometimes they can have a red or a green sheen to the spines depending on the angle you are looking at it and the way the light reflects. The sea urchin's body is made up of what they call the "test" that is the round ball like part, and the spines. The spine operates on a ball and socket type joint which allows the urchin to move its spines in all directions. It has a simple nervous system and no brain! There are three main parts that make up the inside of the sea urchin: The stomach, the gonads and the"Aristotle.s lantern", which helps in feeding.